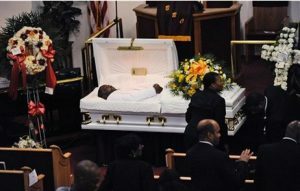 Elected officials told mourners the world was watching Friday as they remembered an unarmed man shot dead by a rookie police officer in a darkened public housing stairwell. The wake came two days after a grand jury on Staten Island decided criminal charges weren’t warranted against a different police officer in the chokehold death of another unarmed man, Eric Garner. Last week, a Missouri grand jury decided not to indict a police officer in the fatal shooting of unarmed 18-year-old Michael Brown. The cases have sparked debate around the country about the grand jury process. The Rev. Al Sharpton initially planned to speak at Gurley’s service Friday but later said he wouldn’t attend because of differences among Gurley’s relatives. Gurley’s funeral is scheduled for Saturday. He was “always a faithful, faithful person,” his stepfather, Kenneth Palmer, told mourners Friday.